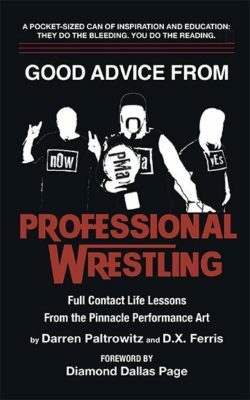 This Sunday not only marks WrestleMania 35 – but also the release of Good Advice From Professional Wrestling: Full Contact Life Lessons From The Pinnacle Performance Art, a new book by authors Darren Paltrowitz and D.X. Ferris. The two will lay claim to the Universal Motivational Tag Team Title when the book drops via 6623 Press this coming Sunday, April 7. Order now via Amazon, where the e-book is already available and is positioned at #1 on the Kindle Store’s New Releases in Wrestling Books chart! This eminently readable self-help manual finds useful life lessons in inspiring quotes by icons from Dwayne “The Rock” Johnson to Bruno Sammartino. Whether you’re a fan, teacher, salesman, or landscaper, Good Advice From Professional Wrestling is an entertaining guide on how to get over and improve your life, one step at a time. The book’s foreword was written by WWE Hall of Famer and international fitness guru Diamond Dallas Page. Good Advice From Professional Wrestling concludes with a list of ten habits and practices that famous wrestlers use to become successful, which readers can start today. The book features wisdom from over 40 wrestling-world greats of today and yesteryear, and archival quotes from rising stars to all-time greats like movie star Dave “Bautista” Batista, rock singer and Hall of Fame inductee Lita, MLW star Salina de la Renta, A.E.W. co-founders Cody Rhodes & the Young Bucks. WWE counterculture iconoclasts Daniel Bryan& CM Punk, accredited dentist and A.E.W. marquee talent Britt Baker, the late Rowdy Roddy Piper, rock star Billy Corgan, and ECW mastermind Paul Heyman. Good Advice From Professional Wrestling is the second volume in 6623 Press’ Leadership Every Day Series, which finds life-changing lessons in popular culture. Volume 1 is Ferris’ Good Advice From Goodfellas: Positive Life Lessons From The Best Mob Movie. Based in Akron, Ohio, 6623 Press makes unconventional, useful, creator-owned, reasonably priced books about popular culture, success, history, and other cool stuff. Darren Paltrowitz is an entertainment-industry veteran from Long Beach, New York. His writing has appeared in the New YorkDaily News and the Los AngelesTimes. He hosts the podcast, “The Paltrocast With Darren Paltrowitz.”. D.X. Ferris is an award-winning writer, Pittsburgh native, and Ohio resident. He has written for Rolling Stone and Alternative Press. He wrote books about Slayer and leadership. This is his ninth. He is plotting a heel turn.